The Society also celebrates the important role the artists have played in preserving the Court’s history. 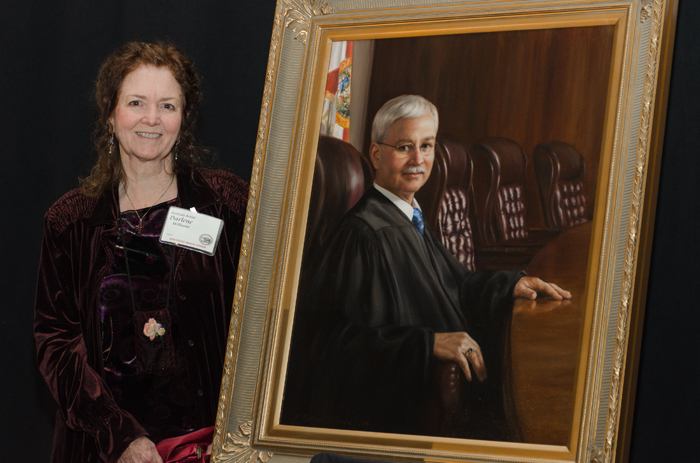 The artists of the four newest portraits, Jeff Bass and Darlene Williams, were honored for their work at the Annual Dinner and the Portrait Presentation Ceremony. Without these and other artists, we would not have these bookmarks which spark memories of days past and are things of value to be collected, preserved and admired. I completed my first painting at age thirteen, at my Mom’s elbow, and continued to paint and draw through my teen years. My mom always had a keen interest in painting, and continued to do so until her vision and health prevented it in her early 90’s. My Dad was in the military and we travelled frequently as I grew up. I majored in Science in college, graduating with a degree in Natural Science from Rutgers University. After two children and finding myself as “head of household,” I followed the avenue of teaching high school science, and eventually received a Masters degree in Science Education from Nova University. My science teaching career, however, was to last only 15 years. Those classes prospered for nine years, until I moved to the Tallahassee area in 1988. Four years later I again moved to an area just outside Havana, FL, where I had a studio on the property, and soon continued teaching classes. Word of mouth was my only advertising. Those were the first steps toward doing what was to become my burning desire in life: painting and helping others to enjoy the same. Portrait painting remains an enduring love. There is something intriguing and inspiring about capturing the essence of a person. I feel as though I bond with each subject at some very real but ethereal level as I paint. I sense something similar even if painting horses, other animals, or even landscapes. There is beauty in everything, and I want to share it. I consider myself an “Intuitive Realist” in art, a phrase I created to describe my attempt to express my subject in a realistic way, but also to go deeper and bring out an essence I can feel as I paint. Although I am primarily a self-taught artist, it has been a true delight when I could occasionally enjoy taking a workshop or a few classes. I also studied briefly with Ed Gordon in his later years. In 2000 the opportunity presented itself to open my own gallery in Havana, FL. It is both a working studio and an art gallery. Since then I acquired the space adjacent to mine, and now share the gallery with my older son, Thomas M. Thomson. 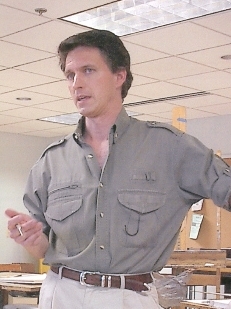 My younger son, Ron Thomson is also a full-time artist in Fairhope, AL where he lives with his family. In my shop, D Arthur McBride Portrait Studio and Gallery, I enjoy “painting at the window” and also teaching six classes per week. Although I have remarried since my former husband passed and am now Darlene Williams, I have kept my former professional name for my business as well as my painting signature: D. Arthur McBride.